Hailing from Nottinghamshire, Sven Fredriksson is the singer/songwriter for band The Fall Of Ego. 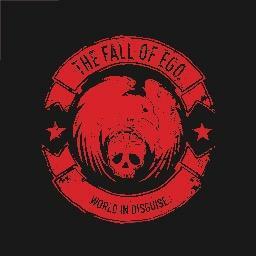 With the release of a new album 'World In Disguise' coming soon we thought it would be a great time to introduce you to The Fall Of Ego by talking about two previously released tracks of the indie rock genre. First of all, we have 'One of These Days' - a relatively slow paced yet uplifting track. Cymbals and drum crashes punctuate the chorus with more mellow patterns providing a good contrast during the verses. The track starts off with these cymbal crashes mixed with the repetition of clean guitar patterns and bass lines to create an intriguing atmosphere. The raw, piercing, warm toned vocal enters with the line 'this is me' - a very striking beginning to the track. Another emotive moment comes towards the end of the track when the line 'I will show you all' is repeated and layered with background vocal accompaniment to emphasise the emotion contained within the lyrics. This allows the track to finish perfectly - drums and guitars fade, leaving the sound of a vanishing vocal line and final shake of a tambourine to end 'One of These Days'. With inspiring lyrics, the more you listen to this track, the more you grow to love it. Next up is 'Out Of Reach'. Although still relatively slow, this track starts off very minimalist in terms of instrumentation, with just a vocal and simple guitar pattern. This allows you to really listen to the lyrical content, appreciate the emotional value of the track and let your mind wander. But - don't wander for too long. With the roar of electric guitar and crash of drums, the track picks up the pace and gets way more intense - the calm before the storm has disappeared. This intensity is kept up throughout 'Out Of Reach', especially within the chorus which is actually rather catchy - listen to it enough and you'll start to hum it - guaranteed. The final chorus is followed by an impressively energetic guitar solo and uniformed guitar and drum crashes follow, eventually leaving just a simple repeated guitar pattern to drift away, finishing the song as it began (which is a nice touch). Hopefully these two tracks provided you with a good introduction to The Fall Of Ego. We look forward to the release of 'World In Disguise'! We now have SoundCloud! Follow us here to be kept up to date. Find out more about The Fall Of Ego here.